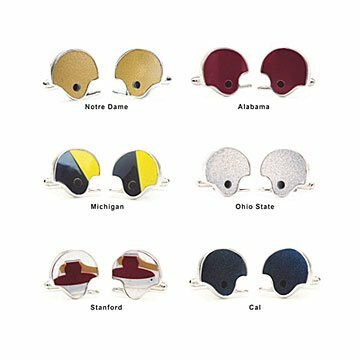 Made from authentic college football helmets, these cufflinks are sure to be a hit with the sports fan. LOVE THIS for any football fan in your life! In a world that has gone way too casual, these beautiful cufflinks (so well made and so unique -- my son is a huge Ohio State fan) showed my son he could set the standard and look fly in something besides a baseball hat and Nikes. He LOVED them. I bought him a beautiful white shirt made for cufflinks and he wore both to Christmas dinner -- of his own accord! He will have these forever! Great gift for the guy who has everything! I bought these for my husband -USC, of course- and he absolutely LOVES the, he has received so many compliments and I continue to get a thank you every time he wears them or pulls them out. For the true college football fan, he will love these. A little pricey, but full certificate of authenticity and beautiful carrying box. Thank you!! Gave these to my husband, an OSU fan, for our anniversary. He absolutely loves them! Great unique gift idea!